Students practice the basic addition and subtraction number facts to 10, to begin to become familiar with basic number facts. 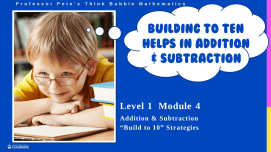 Teaching Teacher notes: Strategies to teach all the addition facts. Count on, doubling, rainbows etc are all shown in detail. Introduction to the strategy of “Count on 1”, using a ten frame and number line for subitizing answers. Includes turnaround facts and missing number questions. Introduction to the strategy of “Count back 1”, using a ten frame and number line for subitizing answers. Includes turnaround facts and missing number questions. Introduction to the strategy of “Count on 2”, using a ten frame and number line for subitizing answers. Includes turnaround facts and missing number questions. 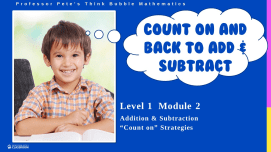 Introduction to the strategy of “Count back 2”, using a ten frame and number line for subitizing answers. Includes turnaround facts and missing number questions. Introduction to the strategy of “Count on 3”, using a ten frame and number line for subitizing answers. Includes turnaround facts and missing number questions. Introduction to the strategy of “Count back 3”, using a ten frame and number line for subitizing answers. Includes turnaround facts and missing number questions. Introduction to the strategy of “Rainbow Facts”, using a ten frame for subitizing answers. Introduction to the strategy of doubling numbers to 10, using a ten frame for subitizing answers. Includes missing number questions. Introduction to the strategy of halving numbers to 10, using a ten frame for subitizing answers. Includes missing number questions. The remaining addition fact 4+5 and its turnaround, and revision of all addition & subtraction facts to 10. Revises all previsously learned addition & subtraction facts to 10. Set of 5 assessment tests to check on how students are progressing with each of the units in the Introductory Addition & Subtraction Facts to 10 series of worksheets. 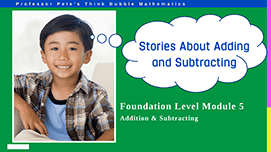 Set of 10 homework sheets to match each of the sets in the Introductory Addition & Subtraction Facts to 10 series. Contains information for parents.